Observation - Chalkhill Blue butterflies - UK and Ireland. 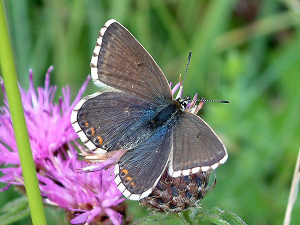 Description: Fairly large numbers of Chalkhill Blues feeding on various purple flowers on chalk grassland slopes. Fairly large numbers of Chalkhill Blues feeding on various purple flowers on chalk grassland slopes.